While most Americans still identify as Christian, there are big differences when it comes to how involved they are with a congregation – or whether they’re involved at all. Indeed, some of the largest Christian denominations in the U.S. have relatively low levels of involvement among their members. Among all Christian religious traditions in the U.S., Mormons and Jehovah’s Witnesses have the largest shares of members who are highly involved in their congregations, according to a new analysis of data from Pew Research Center’s Religious Landscape Study. Our analysis uses a scale we created drawing on the survey’s three measures of congregational involvement: membership in a congregation, frequency of attendance at worship services and frequency of attendance at small group religious activities. While these three measures don’t encompass all the potential ways people might be involved in their congregations, they represent common and broad categories of congregational engagement. Those who are members of a congregation, attend religious services at least weekly and attend a prayer or scripture group weekly or monthly are categorized as having a “high” level of congregational involvement, while those who are not members of a congregation and who seldom or never attend religious services and small group prayer or scripture-reading groups are in the “low” category. All other respondents are categorized as having a “medium” level of congregational involvement. Among U.S. adults who are Christian, three-in-ten have a high level of congregational involvement, while 58% have a medium level and 12% fall into the low category. For some groups, however, much bigger shares of members are highly involved. Among Mormons, 67% have a high level of engagement, while a comparable share of Jehovah’s Witnesses (64%) are highly involved. Indeed, these two groups have the highest level of involvement by all three measures – membership, church attendance and small group activities – we used to create our scale. Overall, evangelical Protestants (43%) and members of historically black Protestant denominations (41%) are less likely than Mormons and Jehovah’s Witnesses to have a high level of involvement in their congregations. However, some denominations within these two religious traditions are highly involved. For instance, a majority of members of the Church of God in Christ (57%), a historically black Pentecostal denomination, have a relatively high level of involvement, as do 56% of Seventh-day Adventists and 44% of members of the Southern Baptist Convention, the country’s largest Protestant denomination. 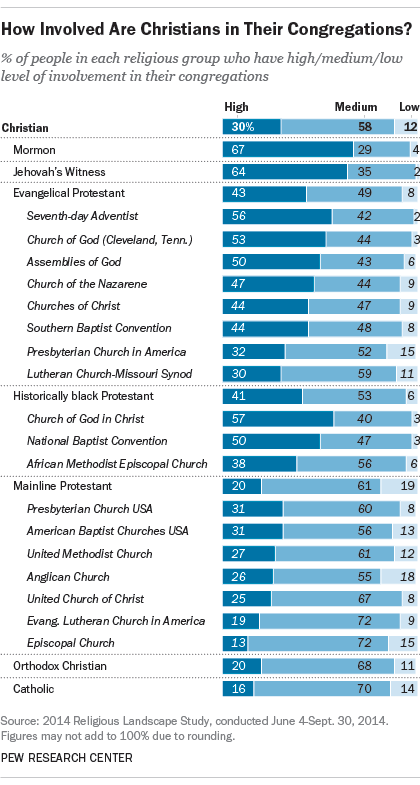 Mainline Protestants and Catholics are least involved in their congregations. Just 20% of mainline Protestants are highly involved. And among Catholics, 16% are highly involved, according to our measure, while a solid majority (70%) have a “medium” level of involvement. Indeed, most mainline Protestants and Catholics fall into this medium level of engagement in part because while many of their members attend religious services, they do not participate in a prayer or Scripture group on a weekly or monthly basis.